An abscess or gum boil can be painful and frustrating, especially if it becomes pus-filled. What does it mean to have a boil in your gums? What are the causes and symptoms? We’re including explanations and photographs, and we’ll let you know how to treat dental abscesses at home with DIY remedies. Plaque, food particles or bacteria may become trapped beneath your gum surface. This places you at risk of infection in the bones and tissues around the jaw line. If you have abscesses or gum disease, you may develop gaps or pockets along your gum line. These pockets may harbor bacteria when food particles become trapped within them. Bacteria cause gum abscess from the infection. If your gums have a bump, it could be hard and fibrous or filled with fluid. Boils may be red or the same color as your gums. 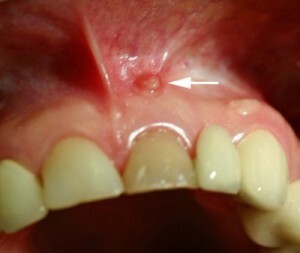 This dental infection type has a sac containing pus on your gum line. Bacterial infection can penetrate into your gums after mouth trauma or injury. Food particles may stick in your gum line, which leads to gingival abscess. Seek dental treatment, or it could spread to neighboring gum tissue, causing damage to the gums that support your teeth. If the pocket in your gums experiences excessive and rapid bacteria growth, you will be prone to the development of periodontal abscess. See your dentist for treatment, or it could cause severe, irreparable damage to your surrounding ligaments and bones. You may even lose the affected tooth. 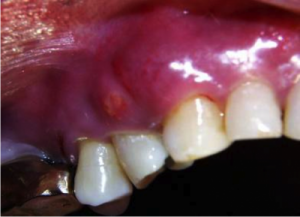 If you have a severe infection at your tooth base, you may develop periapical abscess. The tooth’s soft tissue will develop pus and become swollen. It can be quite painful, and may spread to your jawbone. This can result in bone loss or tooth loss. This infection is chronic and encourages the accumulation of fluids in your root canal. Chronic gum boils may also cause chills, vomiting and fever. They may be accompanied by upset stomach. A lump or pimple-like bump on your gums may cause constant, sharp pain. You can apply warmth or pressure to the boil, but the pain is often extreme. Gum boils – What causes them? If you have poor oral and dental hygiene, you may develop a boil or abscess along your gum line. Food particles may enter the gap between your teeth and gums, especially if you have periodontal or gum disease. Abscesses that appear as boils may form in infected areas. This is the natural response of the body to fight bacteria. Pus may collect in the root canal, gums or teeth. Bacterial infection tends to cause abscesses through trauma, as well as the decay of the root canal and tooth. If you have a weakened immune system cause by medical problems or as the side effect of some medications, this can cause an abscess on your gum line. Inform your dental professional before your appointments, to reduce the risk of more infection. A mass or lump on your gums may indicate several different health conditions. It could be soft or hard, and be located anywhere along the gum line. Tumors in the jaw or teeth or oral cancer in the mouth or gums can cause masses on your gums. Oral cancer usually affects the tongue or lips, but it can also be found in the lining of the check, or on the roof or floor of the mouth. If you see a bump along the gum line, consult your dentist or physician for a consultation. Gingiva, or gum cancer, starts as a bump in the gum line. This is a squamous cell carcinoma and they usually spread quickly. If you consume a lot of alcohol or you’re a heavy smoker, it may increase your risk of oral cancer. Another reason for gum line swelling is the decay of teeth. When you have a tooth that is decaying, the tooth nerves die and this leads to a bacterial infection. Your body will produce white blood cells to fight infection, to get rid of toxins and infection in the area affected. Tooth decay is exacerbated by fizzy, sugary drinks, chocolate, or sticky and sweet foods. These will collect in the gap between your gums and tooth, attracting bacteria and putting you at a higher risk for abscess development on your gum line. If you have lumps on your gums that come and go, this indicates infection. It can happen after you have a root canal procedure, indicating that the root canal therapy did not completely treat the infection. Antibiotics may help to fix this problem, or you may need to have minor surgery from your dentist. Is it normal to have boils on the gum line when you’re pregnant? Pregnancy causes hormone changes that may heighten your risk of periodontitis or gingivitis. This can also cause gum inflammation and gum disease. Tumors from pregnancy are usually benign and will disappear by themselves. If this inflammation makes it hard to chew, visit a dental specialist and have the tumor removed. This is a simple procedure and only requires local anesthesia. If you have severe tooth decay that includes your root canal, the tooth may need to be removed. This removes infected tooth material and bacteria, and prevents the chance of the infection spreading to neighboring bone and tissue. Your dentist will need to remove the tooth, nerves and infected pulp in the root and tooth. After the root canal is removed, your dentist will use other materials to fill in the space left open. If your abscess is caused by periodontal disease, get a deep cleaning to remove any active bacteria from the mouth, and in the gaps between teeth and gums. It can be a costly procedure, and may require frequent repeated therapy. 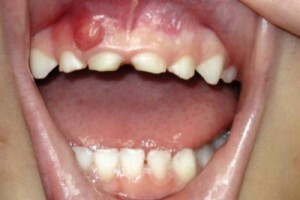 Gum line abscesses may be treated with antibiotics. They help in fighting the bacteria that cause the boils. Your dental professional may prescribe an antibiotic to help kill mouth and gum infection. If your gum boils are causing discomfort or they are cosmetically a problem, you may elect to have them removed surgically. Abscesses along the gum line may be drained in order to get rid of the pus. The boil may recur after surgery. If your abscess or gum problem was caused by poor denture structure or overgrowth, a dental professional can reconstruct your denture. This will prevent gums rubbing and friction that might cause swelling. Turmeric is quite helpful in reducing inflammation in the gums. It may also aid the abscess in becoming smaller. Mix one teaspoon of powdered turmeric in one cup of water. Make it into a paste. Use water to clean your mouth. Directly apply the turmeric paste on all affected areas. Press the turmeric on the infected area of the gums with a cotton swab for about 10 to 15 minutes. Rinse with lots of clean water. Repeat two times or more each day for a week. Salt is an excellent remedy for infections. It is helpful as a pain reliever and also can reduce swelling, which speeds up the process of healing. Add one teaspoon of salt in one cup of warm water. Rinse your mouth with this solution, targeting the area of infection. Gargle with a mixture like this a few times each day for five to ten minutes. You will find that gargling with salt water helps to relieve the pain, which is one good indication that the bacteria are being killed. You can use more salt in the water if you wish to kill bacteria more quickly. This home remedy works quickly to treat abscesses in the gums, as well as within root canals of the teeth. Use a tablespoon of coconut oil. Sip it into your mouth. Slosh it around in your mouth for about 20 minutes, but don’t swallow it. Spit out the coconut oil and then rinse out your mouth with clean water. Repeat this remedy a few times a day to relieve pain and swelling. Garlic is an all-natural killer of bacteria that you probably already have at home. 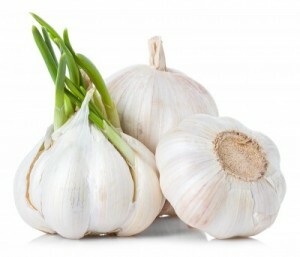 Raw garlic juice can be quite helpful in fighting infection quickly. Use one clove of raw garlic. Crush the clove and squeeze out the juice. Apply the garlic juice to the affected area. Do this a few times per day for the best results.